Versatility is what it's all about. 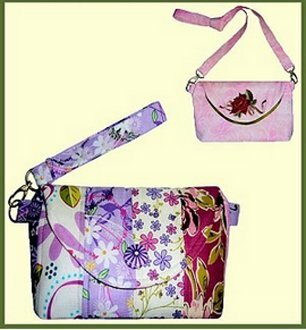 "Charming Little" can play so many roles - carry it as a clutch, wristlet, or shoulder bag. This petite cutie has so many possibilities. It's perfect for strip-piecing, quilting, machine embroidery, or just plain and casual. There's an ID/credit card holder kept secure under the front closure flap and a convenient and easy-to-apply zipper pocket on back. There's even another pocket(s) inside for more organization.